Main feature * High speed, high precision, easy operation and maintenance * Automatically optimization cutting plan via optima/R. General needs: In containers, to be packed with standard packing-materials which is suitable for long-distance ocean shipping. , Ltd is a professional high-tech enterprise which is engaged in glass deep-processing equipment design, R&D, manufacturing, sales and after-sales service. After checking the suction,automatically puting the glass on the cutting table. Flotation device: *more than 100 stomata evenly arranged in the cutting table to ensure the stability of the air, push and pull the glass is very simple. Q: This is my first time using this kind of machine, is it easy to operate9 A: Of course the cnc glass cutting machine is easy to operare. select each part carefully, we are strive to quality first when machine production and test each machine before delivery. 2) We can send our engineers to repair your machines 3.Do you provide equipment operation training9 A: Yes. We can send professional engineers to the working site for equipment installation, adjustment, and operation training. Full Automatic CNC glass cutting machines used cnc glass cutting machine Parts Show Samples show Features 1.All of the heads can work together to save your time and costs. The number and power of the spindle are to be adjusted by the consumer's needs. 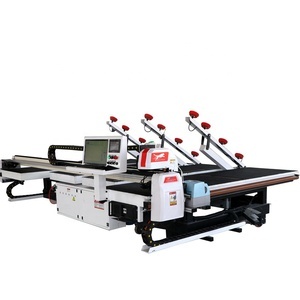 4.The solid and permanent structure plus unique design make the machine with long service lite performs well . 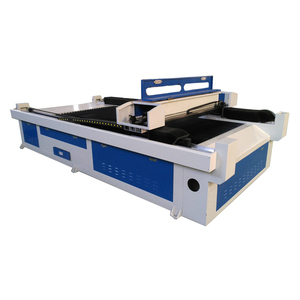 Semi-automatic glass cutting machine, Semi-auto laminated glass cutting table 1.Functions Characteristics: This automatic CNC-shaped glass cutting machine allows users to cut out any shape of glass with high precision. AUTO CAD designed graphs and figures, automatic cutting, with all the cutting data fully computer controlled. 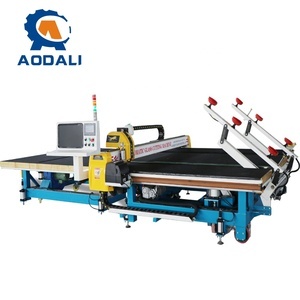 The operator can edit the glass size for cutting with The computer can optimize the cutting size, and give out the data for processing, driven the machine to cut glass sheet automatically in high speed and high precision. Qingdao Good News Industrial And Trade Co., Ltd.
Air float cutting table make the loading and unloading of glass sheet easier. 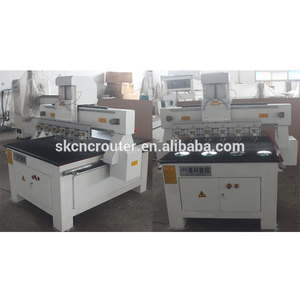 Glass breaking machine and Glass loading machine are optional. Glass cutting optimization software is optional. The cutting table width is 2700mm Y axis Characteristic Cast iron is used as the foundation base , 1500MM cutting range . 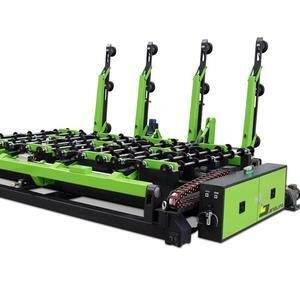 our machines are with excellent quality - efficient and accuracy, economical investment with low initial cost and low maintenance cost to our customers. our new FLOW type cutting head can improve you 10% cutting efficiency, and our new technology can make the machine moving speed to 30-50m/min so that reduce you 15%-50% cutting cost according to the materials. Applicable to electronic products and decorative products cutting machine Note: mainly for the material of capillary glass tube, rod, etc. 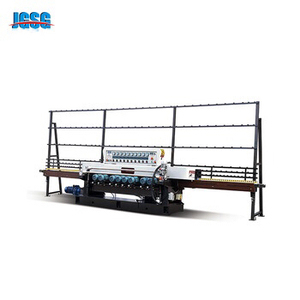 Q: What&rsquo;s the warranty for capillary glass tube cutting machine 9 A: One year, If you need to increase the warranty, need extra cost. Q: Do you provide accessories for capillary glass tube cutting machine 9 A: Yes, we will provide some additional loss of accessories. 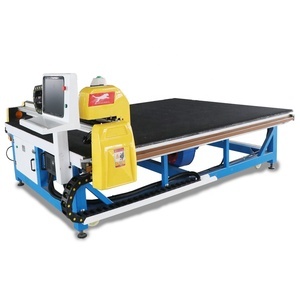 After moving glass sheets to designated location, transport glass tothe CNC cutting table. After cutting, glass will move to the breaking table. * Engineers available to service machinery overseas. 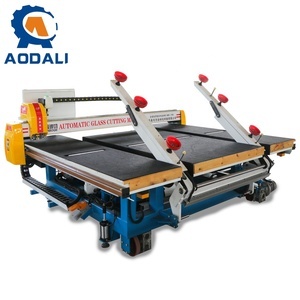 New Technology of screen glass cutting machine The machine adopts imported or domestic first-line brand electrical pneumatic components, effectively protect the cutting precision and stability, to meet the various shapes of glass cutting. 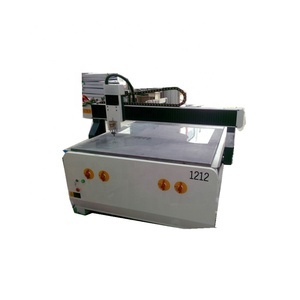 Advantage of screen glass cutting machine 1) using the latest generation of control system, the real realization of the equipment and computer linkage closed-loop, high-precision, high-speed cutting machine. 5) with internal air pump and inlet air filter device to ensure that the cutting assembly is stable and effective high-speed cutting, greatly reducing the failure rate. 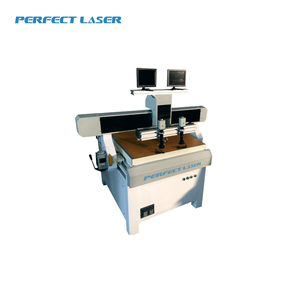 It adopts linear grinding head motors,low noise and few malfunctions,possessing the characteristics of advanced structure,high working precision and easy operation. If container is too tigher,we will use pe film for packing or pack it according to customers special request. If container is too tigher,we will use pe film for packing or pack it according to customers special request. The glass cutting head is removable, when you process glass, you can install it, when you process wood MDF plastic, you can use the spindle. Since the establishment of the company in line with the spirit of innovation, with many years of production and accumulation of rich experience, learn from domestic and foreign advanced numerical control technology. Our excellent management, the operation of the University and a large number of professional technical personnel. Q: Is cutting glass physical or chemical? Q: Where can a glass cutting board be purchased? A: One can buy a glass cutting board on websites like eBay , Amazon , Bed Bath and Beyond , Joseph Store , Housewares , Squidoo , Fifteen Shop or Chow Hound . Q: Why is diamond used for cutting glass? A: Because diamonds are the harshest substance on earth known to man and , therefore , would presumably make a precise cutting . A glass cutter marks the cutting on the glass using a diamond-tipped instruments was later taps one side of the cutting with a rubber mallet , to segregate the slices .